We’re Prepared Wednesday: Starting your Stockpile on a Budget and Saving Money in the New Year! The events of the past year have made it plainly clear to me that I need to get back to the basics, which includes focusing on emergency preparedness! Since I started using coupons, I have had a pretty extensive stockpile of personal care items and food items. Having that stockpile had a huge impact on our budget because we weren’t buying things on a regular basis and I could meal plan around items we had on hand. When we were hit with financial surprises (including my husband being unemployed for awhile), we were able to rely on our stockpile. My stockpile isn’t what it used to be and one of my goals this year is to focus on rebuilding that. My other goal is to focus on making sure we have cash on hand for emergencies. If you know much about Dave Ramsey, one of the first things he recommends is a $1,000 Emergency Fund and we do have that, but I look at that as “sacred” and don’t want to use it unless we actually do have an emergency that we can’t cover. If you’ve ever been through any sort of natural disaster, though, you know that for the first few days afterward, systems may be down and many places, including gas stations and grocery stores, operate on a cash only basis, so having cash on hand is important, too. 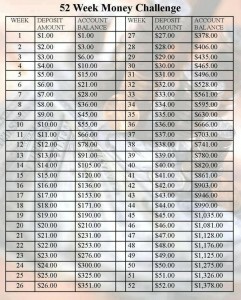 I came across this 52 weeks Savings Plan on Pinterest and I think it’s PERFECT for helping us to save cash to have on hand for emergencies and I will also use some of it for our Christmas savings. The first week of the year is over, but you only need $1 to get started, and I think most of us can come up with that (if not, look in your couch, your car, or in the laundry room!). SURVEYS: these are all reputable survey companies that I have personally used! Sadly this offer is not currently available. I will let you know when it’s back! My other goal this year is to re-build our personal food storage. I found a few different programs that help you to build up your food storage by purchasing items on a weekly basis. I think that you have to look at what “works” for you and your family when doing this, but this at least gives you some ideas for getting started! The two plans above both recommend buying laundry detergents and bleach this week. There is a GREAT deal on Tide this week at Kroger (especially if you have the $1.50 off coupons) and there is also a great deal on All at CVS. I’ll be updating you on my savings progress and food storage progress each week in my Savings Saturday post! I can’t wait to hear about your progress, too! A few days ago, my husband needed some hydrogen peroxide. I was just sure that we must have some somewhere. I could vividly remember that it was super cheap at Walgreens not that long ago. 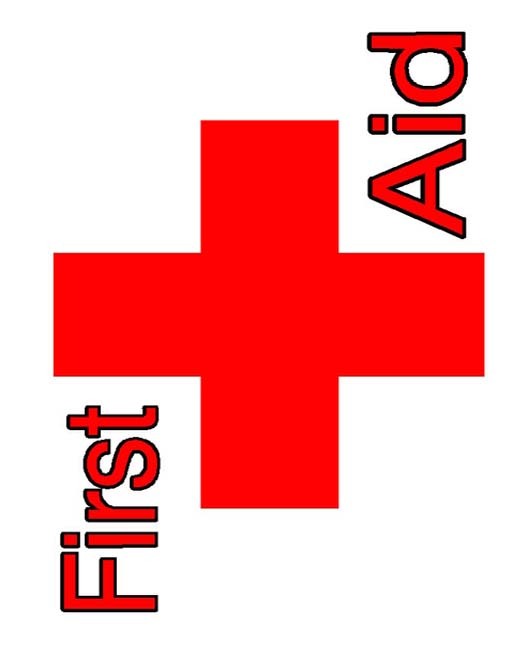 I never did find any and as I was searching for that, I quickly realized that many of the items in our first aid kit were in short supply or outdated. If you need a first aid kit or it’s time to update some of the items, Target has some great deals to help you do it on a budget! Please keep in mind that the prices included are based on pricing at my store and that pricing at your store may vary based on your market. Shortly after we moved to Texas, Hurricane Katrina hit followed by Rita and then a few years later, we had Ike. I’ve learned the importance of being prepared and having things on hand from those experiences, but one of the bad things about having a stockpile is that you start to take it for granted and assume that everything is always there. I’m devoting Wednesdays over the next few weeks to working on getting more prepared and I’ll share what I’m doing with you as I go! 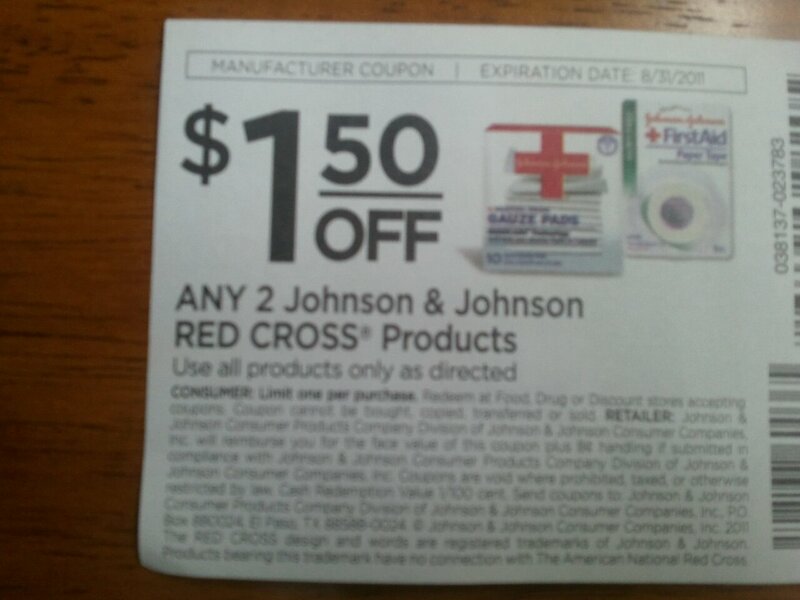 I found this coupon for $1.50 off ANY 2 Johnson & Johnson Red Cross products on a tear pad at my local Kroger store. I’m going to use that to replenish some of the items in our first aid kit. 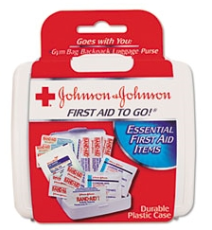 The Johnson & Johnson First Aid kits are just $.99 and have a few basic items. They are great for your car or diaper bag! They’re just $.48/each after coupon when you buy 2! I’m also going to be looking for a new, more effective way to store mine. Hopefully, I’ll be sharing pictures of the finished product with you next week! I’d love to see pictures of your kits, too!